As a vegetable source of protein, AIM ProPeas™ provides 12 grams of protein per serving in a low-sugar, low-carb, low-fat concentrate. Protein is a key component to weight management, helping with satiety, metabolic rate, and lean muscle mass. In addition, the vegetable pea protein in ProPeas offers a safe, allergen-free alternative to common whey and soy protein options. Sweetened naturally with stevia, ProPeas tastes great mixed into a smoothie or combined with chilled rice milk. Protein is key to living well. The human body needs a significant amount of protein in relation to vitamin and minerals. Protein keeps body tissue healthy by building up, maintaining, and replacing the tissues that compose our muscles, organs, and immune system. Proteins are composed of amino acids that, once consumed, are used individually by the body for a number of necessary functions, including the creation of enzymes and hormones. Alone, humans are only able to naturally produce about one-half of the necessary amino acids that are most important for sustained health. The rest must be derived from protein-rich foods. ProPeas contains 12 grams of pea protein per serving (see accompanying chart on back). The fact that our bodies do not store all the protein that we require makes protein different than fat and carbohydrates. While the latter two can be drawn upon when needed, the same cannot be said for protein, which makes getting an adequate amount in our diets that much more important. 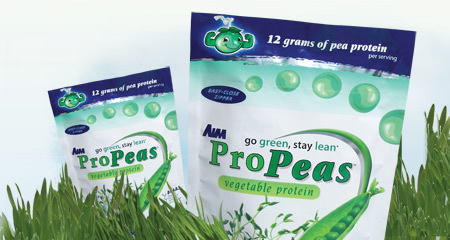 AIM ProPeas™ is an all-natural vegetarian protein source made from field peas. Unlike whey and soy protein, pea protein is not a major allergen. As such, it provides an alternative to most mainstream, animal protein sources that are high in fats and bad cholesterol. Field peas are high in protein, first and foremost, but they are also strong when it comes to low fat and high iron, select amino acids, and omega-3, -6 and -9 fatty acids. The peas found in ProPeas are grown in Canada, the world’s largest producer of nongenetically modified (non-GMO) pea crops. As nitrogen-fixing plants (plants that pull nitrogen from the atmosphere), the peas require no chemical fertilizers, and the purification process for the peas includes clean membrane filtration, where the pea protein is filtered using only water. No harsh chemicals or solvents are used in the process. Another benefit of choosing peas is that they are naturally gluten-free and allergen-free, which cannot be said for soy and whey proteins. Both soy and whey are among the eight most common food allergens that account for 90 percent of all food allergies. Soy protein poses problems in its growing and production process. Nine out of 10 soybeans in the U.S. are Genetically Modified Organisms (GMO), which 30 countries deem to be unsafe. Soy is also high in fats, and removing these fats to attain concentration protein requires the use of solvents. The soy carcinogen furan is also a potential risk when consuming soy proteins. Fifty percent of all children are allergic to whey, which comes from milk and is a byproduct of cheese production. Whey protein also contains large amounts of two amino acids (cysteine and methionine) that are high in sulfur, which has an acidic effect on the body. These two amino acids are found in most all sources of protein; however, they are found in higher ratios in animal proteins. The featured amino acids in ProPeas include lysine, leucine, and isoleucine. These amino acids have been shown to benefit human growth and development, athletic performance, and recovery from stress. Each serving of ProPeas contains these amounts of amino acids: Leucine, isoleucine, and valine make up a special set of amino acids unique to the ProPeas formula. Called Branch Chain Amino Acids (BCAAs), they are vital to delaying the aging process by maintaining the body’s current muscle mass. Leucine - Slows the age-related loss of muscle tissue by increasing synthesis of muscle proteins. As we age, the body’s ability to absorb and synthesize protein lessens, resulting in the loss of muscle mass (sarcopenia). Isoleucine - Increases endurance and energy, while helping to repair muscle and aid in the recovery of muscle. Valine - Repairs tissue, enhances energy, and regulates blood sugar (which can assist in weight loss) and brain function. Consuming five grams of leucine, isoleucine, and valine (in a ratio of two parts leucine for every one part isoleucine and one part valine) per day has been shown to protect against sarcopenia and the loss of lean muscle. ProPeas provides five grams of BCAAs per two servings in the proper ratios. The benefits of BCAAs extend to exercise, too. Many studies have found that BCAA supplementation can help reduce muscle damage that is often a result of endurance-related activities. ProPeas is slowly digested, thus reducing appetite. It also maintains lean muscle, resulting in an increased ability to burn calories. As a high-protein, low-calorie complement to a healthy diet and exercise program, ProPeas can improve your fitness in keeping with the AIM Healthy Cell Concept®. Protein has the potential to control weight in three ways: increasing the feeling of fullness (satiety), increasing metabolic rate, and aiding in the maintenance of lean muscle mass. Satiety - Of the three macronutrients – carbohydrates, fat, and protein – protein takes the longest to digest in the stomach, leading to feeling fuller longer. This feeling of fullness can prevent the over-consumption of calories, which is one of the leading causes of obesity. Metabolic Rate - A faster metabolism can result with adequate protein consumption. Metabolism is the process by which our bodies convert food into energy or store food as fat; the higher your metabolism, the more fat you will burn. Protein increases metabolism by making the body work harder during digestion. When protein is digested, it requires more calories than digesting carbohydrates or sugars, thereby strengthening the body’s metabolic processes. Lean Muscle Mass - As protein intake is increased, the body can create muscle faster and easier. The more muscle someone has, the more calories he or she burns naturally, meaning that a similar amount of food intake could result in losing weight. Similar to the benefits of ProPeas, AIM fit ‘n fiber was also formulated to improve fitness and assist in weight management. These products promote weight loss through healthy sources such as fiber and protein, providing a feeling of fullness while remaining low-fat and low-cholesterol. The two were formulated to be complementary and taste great together.